His Majesty The King and Her Majesty The Gyaltsuen are currently in Sakteng Gewog in Trashigang. In the last couple of days, Their Majesties granted audience to people of Sakteng Gewog, students and teachers of Sakteng Lower Secondary School. His Majesty also hosted tokha and Their Majesties personally interacted with them. Their Majesties arrived in Sakteng on Wednesday, on foot, from Merak Gewog. Their Majesties trekked eight hours, following the ancient route between Merak and Sakteng and crossing the strenuous Nakchung la pass. Nakchung La Pass is over 4,000 metres above the seas level. It rained almost throughout the day, making the journey difficult as Their Majesties had to walk through slippery and leech-infested path. The Dungkhag administration, students and local residents received Their Majesties, when they arrived in Sakteng on Wednesday evening. Yesterday, His Majesty The King and Her Majesty The Gyaltsuen granted an audience to people of Sakteng Gewog. Their Majesties were escorted though a traditional Chipdrel procession to the ceremonial ground where thousands of people from Sakteng have gathered to welcome and meet Their Majesties. Upon arrival at the ground, people offered Tshokchang to welcome Their Majesties. His Majesty granted Tokha to the public and Their Majesties personally interacted with each and every one of them. His Royal Highness Gyaltshab Jigme Dorji Wangchuck and Ashi Yeatso Lhamo are accompanying Their Majesties. Through a lucky draw, His Majesty granted various soelras to the people. Essential items like Television and radio sets, power chainsaw, milk churner, mobile phones, greenhouse, tents, water boilers, rice and curry cookers were granted as soelras. Various cultural programmes were also organised to entertain the people. The local residents performed various traditional dances like Yak Cham. Towards the afternoon, Their Majesties visited the Yuelju Lhakang to offer prayers. Sakteng Dungkhag’s staff and people of Sakteng, led by Sakten Trulku, offered Ku Sung Thug Ghi Mendrel to Their Majesties. 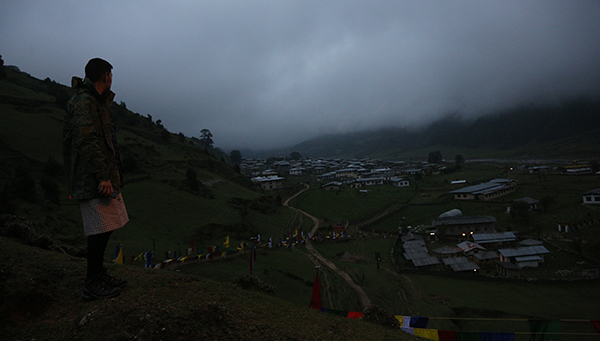 Later Their Majesties visited Borangma village, which is about 30 minutes walk from Sakteng village. Their Majesties personally visited almost every home in the village and interacted with the people. 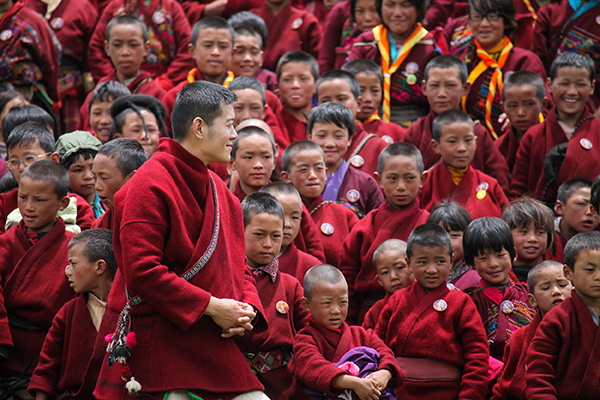 Yesterday, Their Majesties granted an audience to students and teachers of Sakteng Lower Secondary School. His Majesty advised the students to study hard and make best use of their knowledge. His Majesty granted jackets, geometry sets and books as soelra to the children. Sakteng Lower Secondary School has 304 students and 12 teachers. The people of Sakteng Gewog offered Yaks, Sheep, horse and dogs as buelwa offering, in honour of Their Majesties visit to their village. His Majesty expressed appreciation to the people for the offering and returned the animals to the community. His Majesty hosted a Tokha for the people who have gathered to offer Buelwa. Various traditional cultural items like Ache Lham dance by the people and students. Later in the afternoon, Their Majesties visited Lhakhangs and homes, in and around Sakteng village, and interacted with people.